All the Brews Fit to Pint: The Every Two Weeks in Beer: Do You Beer What I Beer? The Every Two Weeks in Beer: Do You Beer What I Beer? Santa Clauses are coming to town... to party! Oh, by gosh, by golly, it’s time for mistletoe and… beer. Yeah, that was lame, but I’m just too darn wound up for the holidays to care. Light displays, tasty treats, presents, orgies of commerce, they’re all wonderful. But most wonderful of all is the chance to raise a beer glass with friends and share a few pleasant hours basking in the warmth of human love and companionship. Aw, now I’m getting all misty eyed. Let’s take a look at some of the places where you can raise that glass from now through Christmas. Do you beer what I beer? » Get into the spirit at the holiday beer tasting at Arbor Brewing, 114 E. Washington, from 7-9 p.m. Sample from more than two dozen winter warmers, spiced ales, Christmas beers, meads, and more, plus enjoy a sumptuous appetizer buffet alongside. If you’re lucky, you could win some festive beer booty including glassware, apparel, or even free admission to the next tasting. Tickets are $30; call 734-213-1393 buy at the door, if available. » Jingle Bell’s? You can with all the change you’ll save at Red Rock Downtown Barbecue, 207 W. Michigan, Ypsilanti, on Thursday nights after 9 p.m., when all Bell’s beers are just $2 (or $3 for the big ones). And to inaugurate this blissful state of affairs, Red Rock is hosting the folks from Bell’s, who are bringing Winter White Ale, Two Hearted Ale, Christmas Ale, and Red Nose ESB to the party. If you show up with two cans of nonperishable food to donate to a local food pantry, you’ll also be entered into a drawing to win one of three cool prize packages of Red Rock gift cards and Bell’s booty. » Don you now your hideous apparel and head to World of Beer, 1300 South University, for the Sam Adams Ugly Christmas Sweater Party beginning at 7 p.m. The first 20 people to arrive in appropriately awful attire will get a free gift courtesy of Sam Adams. But stick around, because there will be other prizes and giveaways throughout the night. And if you are one of the lucky few with a ticket to ride (at $7; call 734-913-2430 to inquire about availability), you can get a taste from the ultra-rare Sam Adams Utopias bottle that will be cracked around 7:30 p.m. Also on tap: Cherry Chocolate Bock, Backwoods Porter, Black and Brew Coffee Stout, Black Lager, Boston Lager, Golden Yuzu Beer, Juniper IPA, Merry Maker Gingerbread Stout, Old Fezziwig Ale, White Christmas Witbier, and Winter Lager. » Stock up on your holiday groceries at Whole Foods Cranbrook, 990 W. Eisenhower, and while you’re there, pay a visit to the Wine and Beer Bar, where from 5-7 p.m. you can get your happy hour on with Warren’s Dragonmead Microbrewery. Tap list TBD. On December 20, the brewery of honor is Greenbush. » Looking for some unique gifts? Want to support local artists? Then hit up the DIYpsi Indie Art Fair at the Corner Brewery, 720 Norris, Ypsilanti, from 11 a.m. to 11 p.m. (and noon to 7 p.m. on Sunday) to shop the wares of 40 local vendors. Also, beer. » It’s that time of year, when the world falls in love – with rare beer from Jolly Pumpkin at the annual Rare Beer Auction. The action begins at 7 p.m. sharp upstairs at Jolly Pumpkin Café & Brewery, 311 S. Main, where you can bid on all manner of vintage JP brews for your beer cellar, with all proceeds going toward the Peace Neighborhood Center’s programs for families in need. Look for Sobrehumano Palena’ole, Biere de Mars Grand Reserve (2010), La Roja (2008), Lambicus Dexterius (2009), Stone-Nogne-Jolly Pumpkin Collaboration 2010, and more. » Over at RUB BBQ & Pub, 640 Packard, Bell’s is in the house with a night full of games, prizes, and (duh) beer. Get there at 7:30 p.m. to sign up for the evening’s festivities. Beer list TBD as of this writing. » At Liberty Street Brewing, 449 W. Liberty, Plymouth, it’s a celebration of a life tragically cut short. Matt Courtright, who began his brewing career at Liberty before moving to Stone Brewing, died in a freak accident on the job earlier this year, and Liberty and Stone have collaborated on a beer in his honor. At 3 p.m., get a taste of Matt’s Dream Rye’D, a “California-style” rye IPA brewed with some hard-to-get hops. All proceeds from sales of the beer will be donated in Matt’s memory to a nonprofit that builds schools in Ethiopia. Stick around until 8 p.m. for a real-time coordinated toast with Matt’s West Coast brewery family at Stone. Requisciat in pace. » Head to Bar Louie, 401 E. Liberty, for the Bell’s “Ugly Everything But the Sweater Party” beginning at 7 p.m. Leave the sweater at home but come dressed in your most craptastic gloves, vests, hats, scarves, boots, pants, coats, snow pants, t-shirts, and so on. Enjoy lots of different Bell’s beers, enter to win cool prizes, and, if you’re feeling generous, donate your duds at the end of the night. » At the Wine Seller, 2721 Plymouth, get some free samples of various Bell’s beers from 5-8 p.m. as you put the finishing touches on your holiday shopping. At least for the beer lovers on your list. » Speaking of, you may want to check out the last-minute holiday sale at Arbor Brewing, beginning today and going through December 23. Get discounts on all gift items including clothing, glassware, Mug Club memberships, growler and pint glass gift sets, and gift cards. Maybe you can even get some stuff for other people. » Maybe you’re some sort of pagan who eschews Christmas but celebrates the official change of seasons. Or maybe you’re not. Either way, you’ll want to drop by the Wolverine State Brewing taproom, 2019 W. Stadium, from 4-6 p.m. for the annual Holiday/Solstice Sing-Along and Canned Food Drive. It’s fun for the whole family, especially for mom and dad, who can drink beer while the kiddies enjoy Kevin Devine’s fun, participatory musical stylings. Bring canned foods and non-perishables to benefit Food Gatherers; bring a whole bag and get $1 off a mug of your favorite Wolverine brew. Stick around until 8, when Kevin’s band, the Glen Levens, takes the stage for some adult awesomeness. » Everyone knows Santa, but have you heard about Krampus? He’s the demonic figure who prowls the streets during the yuletide, punishing Central European children who aren’t so well behaved. The Corner Brewery celebrates this scary dude with the Krampus Costume Ball beginning at 8 p.m. Stop by for special brews, dancing, crazy costumes and a well-deserved night of mischief during the holiday season! » Ho, ho, horrrrk! It’s everyone’s favorite dive bar pub crawl of the season, Detroit Santarchy, where hundreds of Santa-suited fools descend upon the watering holes of the Motor City to spread good cheer and bodily fluids. In past years, Santa Prime has sent a bus to Ann Arbor to allow local Kris Kringles to participate, and it is expected this will be the case again this year. The usual pickup point and time is the Blind Pig, 208 S. First, around 6 p.m. There should also be an Ypsilanti drunk bus. 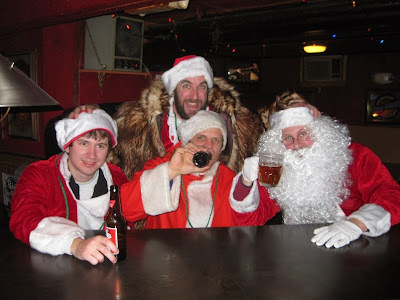 Follow Detroit Santarchy on Facebook and at detroitsantarchy.net for official details as they become available. Good news! Not only are in-house sandwiches a go at the Wolverine taproom, but their Czech Pilsner is back on tap, too. Yum. See the rules for ordering sandwiches at the Beer Wench blog. The Chelsea Alehouse is having a holiday mug sale: get 15% off one 20 oz. or larger handmade ceramic mug, 20% off two mugs, 30% off three, 35% off four, and 40% off five or more. Ann Arbor’s newest multitap beer bar and pizzeria, Bigalora, 3050 Washtenaw, is grokking the local beer with Liberty Street’s award-winning Glutenous Minimus Ale and The American IPA now among its taps. That’s amore! Buy gift cards at Grizzly Peak, Blue Tractor, and/or Jolly Pumpkin and get some goodies for yourself to use in 2014. See each respective establishment for details. Of course, the best Christmas gift of all is a copy of Ann Arbor Beer: A Hoppy History of Tree Town Brewing, available in area stores and online at Amazon. Or if you see me kicking around downtown, I usually have copies with me I can sell (and autograph). Merry Christmas to all, and to all a good beer!